It's Twinsanity: Look Ma, No Hands! 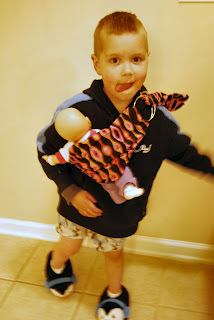 Joshua demonstrates the fine art of babywearing. Sorry, that's all I've got today! ETA: Yes, the mastitis is going away! I still have a large, hard and red area where the infection was but the pain is getting better so I think I'm on the mend!